The smartphone plan battle is getting fierce. Seems that there are changes in every carrier. 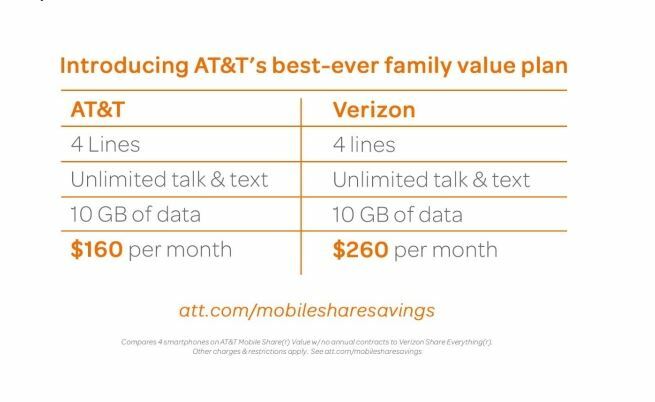 AT&T is now introducing the "Best Ever" family data plans. With the Best Ever Family Plans, you can connect up to 10 smartphones and get unlimited calls and unlimited text . If you want to calculate the price, start off with $100 for 10 GB of data, and add $15 per line. Let’s not forget that AT&T is offering $100 off to new customers that switch over to AT&T (Check out that deal HERE). Makes more sense if you already have a phone that you don’t have to make payments on, or else the price would come out to just about the same. Get ready to take advantage of AT&T’s1 (NYSE:T) best-ever prices for people wanting a family-size bucket of data and unlimited talk and text on the nation’s most reliable 4G LTE network.2 As an example, a family of four can now get unlimited talk and text, and 10GB of data – enough for the whole family to share – for $160 a month. Starting tonight, customers can learn more about the new plans and determine which plan is best for them at www.att.com/mobilesharesavings. Is this new plan making you think twice about switching over to or from AT&T?